Mark Lemon, Managing Director of CSC Services explains how Sika Liquid Roofing Systems offer unrivaled life cycle cost savings in our Guide to Liquid Roofing. For over twenty years CSC Services have completed joint refurbishment and roof membrane installation to service reservoir roofs. 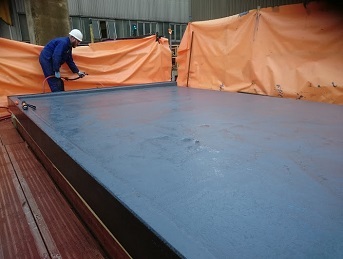 With the specialist coatings division of the company now moving into new industry sectors CSC Services wanted to work with the manufacturing leader of cold applied flat roofing systems that are guaranteed to outlast and outperform traditional counterparts. CSC Services are a Quality Approved Contractor for Sika Liquid Plastics. Sika Liquid Plastics manufactures a range of quality, seamless, cold applied, liquid systems and coatings for the waterproofing of flat roofs, associated walls, balconies and walkways. According to the Liquid Roofing and Waterproofing Association the first liquid coatings used in a waterproofing date back to biblical times when boats were waterproofed using bitumen. Natural bitumen in conjunction with various types of fillers such as sand was used for roof waterproofing as early as the 1820s. The first water based elastomeric roof coating was released on to the UK market in 1975 with single component polyurethane roof coatings launched in 1987 removing the need to mix on site. The liquid roofing industry has grown into a lucrative market with products at the very forefront of waterproofing technology. Liquid waterproofing systems provide one of the most cost effective methods for making a new or existing roof waterproof. Correctly installed and maintained they can provide a long term life often in excess of 25 years, and in refurbishment situations liquid systems can provide savings of up to 70% on roof replacement costs. Liquid applied waterproofing is seamless and fully bonds to the substrate, so is ideal for use over existing roofing, including single ply membranes, profiled metal or fibre cement. If an existing membrane has failed, for example a single ply membrane, applying a simple liquid waterproofing overlay can be a very cost effective solution, and its bonding characteristics make it much more reliable. Traditional methods of application for roofing systems can require temperatures up to 800°C using gas torches, bitumen boilers, and hot gas guns. Creating heat at these temperatures, along with the combustible materials usually found on roofs, is a potentially dangerous combination. The Sika cold applied built-up roof eliminates the need for any heat or naked flame on the roof. Sika’s Decothane polyurethane coatings are fast curing. They can be installed quickly and applied all year round in temperatures above 2°C. A liquid roofing system can be installed over existing roof coverings minimises the cost and upheaval associated with stripping old roofing, and prevents the threat of weather damage associated with other roofing systems. To aid this, CSC Services can undertake work on weekends and evenings where possible to allow for normal services to resume throughout the day. Once installed a Sika Decothane Liquid Plastic Roofing system achieves the highest fire ratings available for a roof system, and its excellent thermal and UV stability makes it suitable for use in all climates. Cold applied liquid waterproofing is suitable for new projects, particularly those with complex detailing, upstands or edge details. A liquid roofing system becomes rapidly rain resistant meaning the roofing is free from rain damage immediately after application. Sika’s Decotahane Ultra utilises patented technology developed specifically for use in highly sensitive areas such as hospitals and food manufacturing plants. It has a much lower odour when benchmarked against other single pack polyurethanes. The Sika Liquid Plastics guarantee offers a single point of responsibility, and ensures that the client is protected against the failure of watertightness caused by incorrect design, defective materials or poor workmanship, through the issue of our Product/Extended Product Guarantee and Final Inspection Certificate. CSC Services believes this guarantee is the most comprehensive available in the roofing industry. The guarantee can provide coverage for 10, 15, 20 and 25 years depending on the specification and when an approved contractor completes the installation. This image shows a Sika Liquid Roofing System installed at Hartlepool Power Station by CSC Services. For more information about Sika Roofing Systems please click here. For an informal discussion regarding our Guide to Liquid Roofing please call 0191 410 3444.